Each year the International Day of Peace is celebrated around the world on the 21st of September, and for the past few years, Rwanda has been joining the world in celebrating this day. Nationally, this year’s celebrations were marked by an event at Amahoro Stadium, in Kigali. Held under the theme “Empowering a New Generation of Peacemakers”, the celebrations included the profiling of peace building activities initiated by young people. 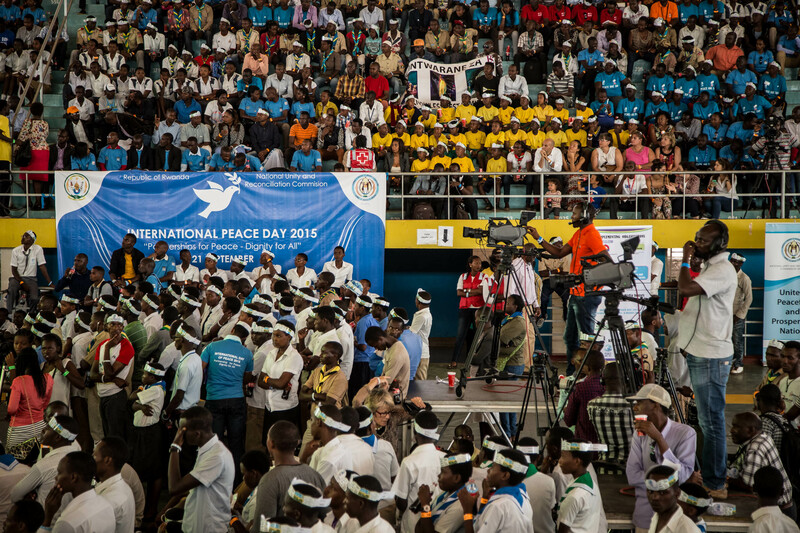 Many young peacemakers attended, including 260 youth champions trained by Aegis Trust through the Rwanda Peace Education Programme. Aegis Trust is involved in and has initiated different programmes to foster peace education and peace building in Rwanda. One of these programmes is the Rwanda Peace Education Programme run in collaboration with Radio La Benevolencija, the Institute for Research and Dialogue for Peace, and the University of Southern California Shoah Foundation. This programme promotes social cohesion, positive values – including pluralism and personal responsibility – empathy, critical thinking and action to build a more peaceful society, and has been included in the national curriculum by the Rwanda Education Board. Additional peace building activities run by Aegis include the training of youth champions. This training programme supports and promotes young people engaged in building peace in their communities through art, story telling and other activities. I cannot forget to mention the onsite and mobile exhibition activities run by the Aegis education team and Kigali Genocide Memorial. These activities are designed to teach the history of Rwanda and the importance of building peace. Thousands of secondary school students around the country, teachers, and others participate in these activities, and value this initiative. The latest and on-going peace initiative supported by Aegis is Walk For Peace. This walk was initiated in Kenya to inspire and engage young people from divided communities and help to break the cycle of violence. The Kenyan world champions in athletics, and the leaders from seven counties (Turkana, West Pokot, Trans Nzoia, Uasin Gishu, Elgeyo Marakwet, Samburu, and Baringo) approached Aegis to facilitate this walk, and to help them teach and build peace like it is done in Rwanda. The walk is open for everyone around the world to join in through this website. Moreover, Aegis has been invited by government leaders and faith communities from South Sudan and the Central African Republic to share their experience in peace education and peace building. Please learn more about what Aegis is doing in these countries, and support its peace activities by visiting the Aegis website. After the 1994 Genocide against the Tutsi in which more than one million Rwandans were killed, the world could not believe that humans committed those atrocities. The authors of the killings and mass sexual abuse were considered monsters – like those we are familiar with in horror movies. But, 21 years after the Genocide, attitudes towards perpetrators are evolving, even though some still question their normality and humanity. This shift can be attributed to efforts to bring about justice. In the immediate aftermath of the Genocide, the alleged perpetrators were arrested and put in jail waiting for trial. This, however, did little to achieve that objective. On one hand, the capacity of the country’s legal system to judge suspects was insufficient due to the consequences of the Genocide and the unprecedented number of cases to be handled. On the other hand, the prisons were overpopulated, and the normal judicial system was not able to handle the problem in those very specific circumstances. Survivors were calling for justice, while the alleged perpetrators and their families were awaiting a fair trial. This situation compelled the government to look for alternatives to the inherited western style of justice. They chose to reintroduce a traditional community based judicial system known as Gacaca. Before the implementation of Gacaca however, certain questions had to be answered: were the Gacaca Courts of the right calibre to judge genocide crimes? How could the tradition-based courts achieve national reconciliation? What would be the reaction from Rwandans in general, and from both survivors and perpetrators in particular? To respond to all these questions, the Rwandan government listened to survivors and perpetrators. Under the umbrella of different associations, survivors expressed their fears, hopes, expectations, and doubts, which were taken into consideration when laws and policies about Gacaca Courts were being drafted. Alleged perpetrators did the same through different associations formed in prisons. This informed the establishment of the Gacaca Courts, which started their work in 2001. Some perpetrators who had confessed saw the benefits of Gacaca and toured the country to encourage others who committed crimes to come forward and speak up. The purpose was to reintegrate themselves and help rebuild the destroyed Rwandan community. The year 2005 was a turning point in the progress of the Gacaca Courts and in the reintegration of perpetrators into their communities. This is because many confessed their crimes, and their testimonies in most cases proved to be genuine. These confessions helped survivors to know the truth. They revealed where victims had been thrown into mass graves, pit latrines, forests, rivers, swamps, and they shed light on how the killings were organised. After the Gacaca Courts finished their work in June 2012, the reintegration of perpetrators required that they be given a space to interact with other members of the society and express themselves. It was also realised that the testimonies of perpetrators needed to be recorded so that the world could learn about what happened in Rwanda and how genocide could be prevented from happening anywhere else in the world. This has been made possible thanks to the Aegis Trust, which established the Genocide Archive of Rwanda. 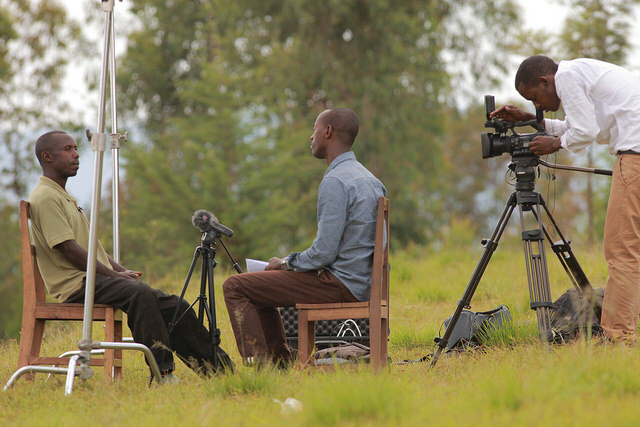 Since 2004, the Genocide Archive of Rwanda has collected, preserved, and provided access to genocide related materials including audio visual testimonies of survivors, perpetrators, rescuers, and Rwandan elders. By visiting the online collection, one can listen and watch perpetrators’ journey from destructive ideology to a life where they are integrated members of society and contributors to peace building and truth-telling. While the testimonies of perpetrators are psychologically challenging to hear, they help us understand and make sense of what happened. By listening to them, we give perpetrators the chance to explain the process by which their humanity was corrupted and how they are trying to regain it. Perpetrators who explain about committing mass atrocities and their desire for reconciliation contribute to building sustainable peace in Rwanda. Perpetrators are now included as stakeholders in telling of the Rwandan story. They contribute to education programmes at the Kigali Genocide Memorial, in the remote areas through outreach programmes and also outside of Rwanda in the Central African Republic where their message of peace and humanity is shared so that future atrocities can be prevented.